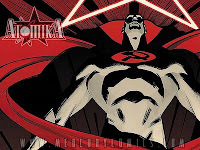 Download the MP3 here On this edition of Word Balloon, Sal Abbinanti creator of Atomika the alternate history of Russian superheroes and villains. Sal explores the iconic images of the former USSR, combined with Russian mythology, but is the first to say this isn't a pro-soviet polemic. "At least once a con a guy wants to argue with me about Communism...or say how are things in Russia and I say 'Guys, come on, Gene Simmons really wasn't a serpent. It's just an act.' " He gives tips to aspiring creators about marketing an independent comic in the current market. "You gotta hustle...I tried going to cons, all over the country like Loretta Lynn with the records and my husband (working) out of the car...doesn't work...I tell new creators, don't release the book until you have 5 issues in the can, you never realize how much time it takes to promote the thing... plus dealing by yourself with colorists,inkers and printers...you never realize how much time it will take." Sal also discusses future projects like The Hostage based on true crime Brazilian kidnappings and the sci-fi comedy Dagos On The Moon.